One of the biggest shortcomings of WinRT for Windows/Windows Phone 8.1 was the state of media APIs – you could play a video file in a MediaElement but anything that involved extracting frames or applying effects was very cumbersome, as you had to put your code in a Windows Runtime Component, and worse of all, you had to write it in C++/CX. Thankfully UWP has come to save the day, and while you still need to use Windows Runtime Components for writing this functionality (with its associated limitations, like making all your public classes sealed), now you can use C# for things like custom video effects, and more importantly, you don’t have to tweak the application manifest anymore to declare the Extension/ActivatableClass for them to be available! Other improvements include new classes like MediaClip, which allows you to load individual videos, and MediaComposition, which lets you create a media timeline to stitch together video clips and render them as a full length video. 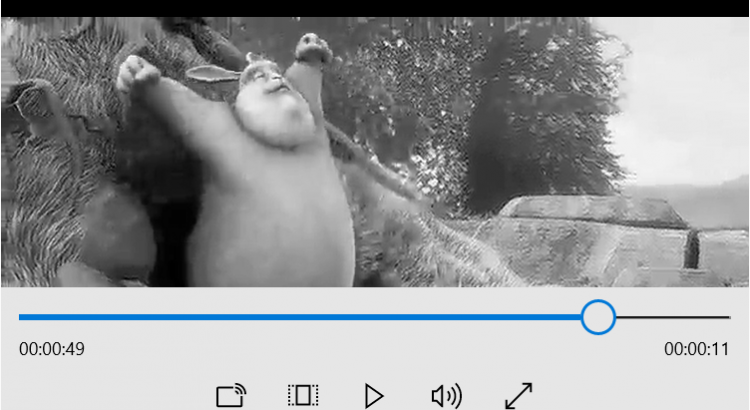 In this tutorial we are going to learn how to create a basic custom video effect that implements the IBasicVideoEffect interface for rendering a video in grayscale, and how to apply it to a MediaClip before playing it through a MediaElement. Now, add a new Windows Runtime Component project to the solution and add a new class to it. This is were we will implement our video effect based on IBasicVideoEffect, and this is very important as trying to implement it on another project type will throw a COMException with error messages Failed to activate video effect/Class not registered when trying to use the effect later. IsReadOnly will return true if our effect doesn’t modify the input frame in any way. Since we are just going to get a source frame and apply a colour transform to it for drawing, we are going to set it as true. SupportedEncodingProperties returns a list of the video formats that our effect will support when outputting the processed video frame. As per the documentation, returning an empty list will give us frames in plain RGB format, which will be the easiest one to work on, so let be it. SupportedMemoryTypes is an enum that lets us specify if our effect will use the CPU, GPU or both for processing the frames. We want to set it to Cpu since this will give us access to the frame data through SoftwareBitmap, otherwise we would get handles to Direct3D data types. TimeIndependent lets us specify if our effect can be used while the playing video is in any playback state. We are going to modify the data per frame so we are going to set it to true. These functions have pretty self explanatory names and we aren’t going to go through them since they aren’t used in this tutorial – however you can check the source code of the sample project for a brief explanation on what they are used for. Finally, let’s explain what the ProcessFrame function does – the most important one, and the one we will be using for processing the frame data and applying our desired effect to the video clip. // Create intermediate buffer for holding the frame pixel data. // Copy bitmap data from the input frame. // Iterate through all pixels in the frame. // Calculate the luminance based on the RGB values - this way we can convert it to grayscale. // Set the pixel data to the calculated grayscale values. // Copy the modified frame data to the output frame. This function receives a ProcessVideoFrameContext as its only parameters, and it stores everything we need for applying our effect. The original frame for the video is stored inside the InputFrame member, and since we specified CPU processing, all the data for the frame image is in a convenient SoftwareBitmap in plain RGB (though in this case it’s ordered in BGR format) data. We will start by getting the pixel data in a Buffer, and temporarily casting all its contents to a byte. Then, we iterate through it in increments of 4 bytes (since the frame has an alpha channel, too) and obtain the grayscale value via the relative luminance formula. Once this is done, we overwrite the R, G and B bytes with the luminance value, effectively obtaining a grayscale value with the same intensity as the source color. Finally, we copy our data buffer to the SoftwareBitmap of the output frame, and we will have a fully working custom video effect.That was easy, wasn’t it? Pretty simple, isn’t it? We obtain a reference to the video file packaged with the app and create a MediaClip from it. 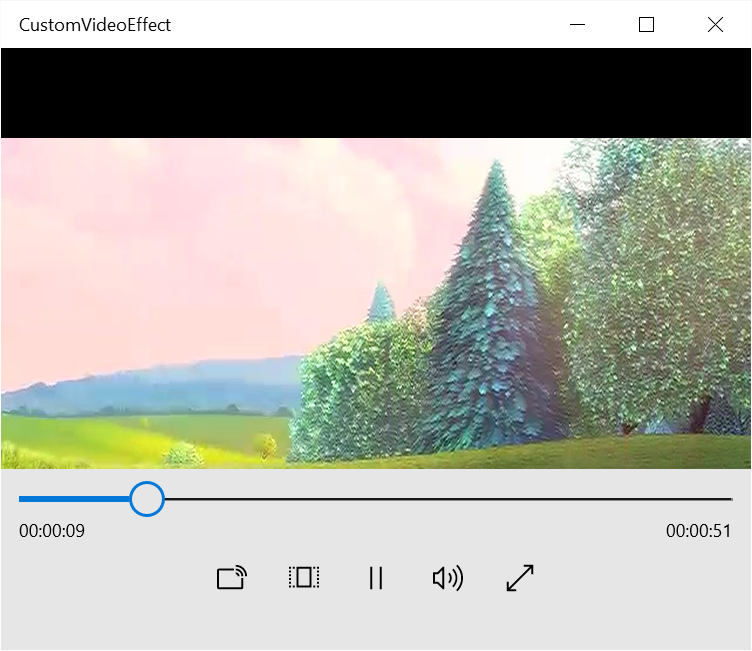 Then, it’s a matter of adding a new VideoEffectDefinition to it with the full name (including namespace) of our custom video effect – the runtime will take care of fetching the type, activating and instancing it. Really easy compared to how convoluted it was in WinRT 8.1! While easy to do and good looking, this approach comes with some caveats. Since we are doing all our processing on the CPU side, computational load is big (it can quickly eat up one entire CPU core even with 720p videos) and memory usage is high since we are allocating a new buffer for each frame – this can be up to 60 allocations per second! It a future article we will look into doing it with GPU acceleration through the Win2D library. 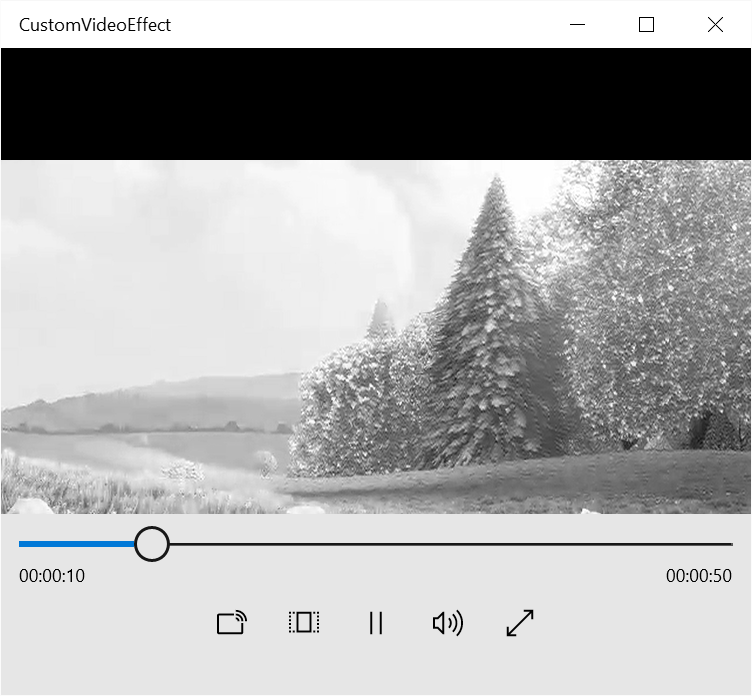 The source code for this sample can be downloaded from the GitHub UWP-Samples repository, under the CustomVideoEffect subdirectory. Why is my adaptive tile not updating on some devices?